The MPL4337B is low cost SCSI and memory card controller board. The board is available in three different versions. The full version MPL4337B-1 contains the SCSI and the memory card interface, the MPL4337B-2 holds only the memory card part and lastly the MPL4337B-3 is the SCSI only board. The MPL4337B is a controller board for the Small Computer System Interface bus, and an interface to Memory Cards through an MPL specific adapter card. The Pseudo DMA mode enables the MPL4337B to achieve transfer rates up to 1.1MByte/sec with an MPL4082. 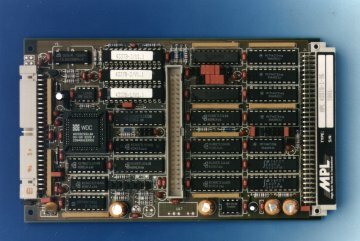 The controller used on this board implements full SCSI bus features like arbitration, reconnect, disconnect etc. in hardware. The controller offers high level commands which eliminate the interrupt handling otherwise required between each SCSI bus phase. Software will be reduced to a minimum. The SCSI implementation on the MPL4337B supports initiator and target role. The asynchronous operating mode on the SCSI bus allows real time applications to work concurrently with data transfers to or from a SCSI device without loss of data or loss of real time capability. All SCSI signals are available on a 50-pin double row connector which uses the pinout recommended in the ANSI X3T9.2 SCSI requirements and used on most SCSI devices available on the market. The Host interface supports synchronous and asynchronous access modes and an interrupt logic which is capable of initiating and terminating both, autovector and non-autovector interrupts. The interrupt can be supplied to all interrupts available on the G-64/96 bus. The MPL4337B also supports interrupt daisy chaining. The Memory Card interface supports Memory Cards up to a size of 2 Mbyte for Panasonic memory cards and 64 Mbyte for JEIDA memory cards. A 512 KWord memory hole is reserved for memory card access. If the card is bigger than 512KByte the other memory can be accessed via a page register in the VPA space. The MPL4337B occupies only 16 bytes in the VPA memory area.